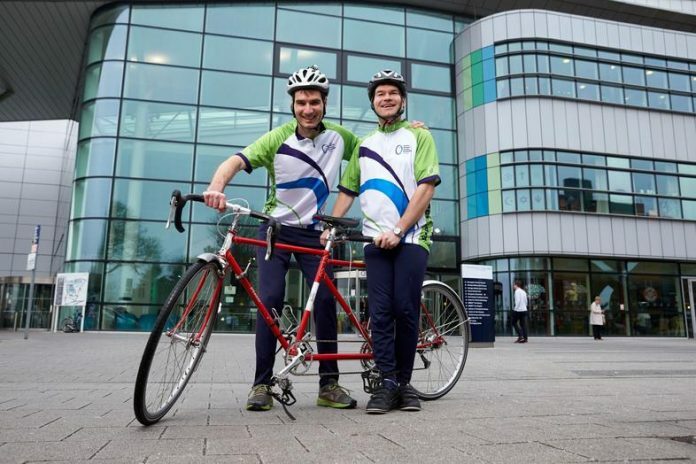 A team of Ophthalmology Consultants at the Queen Elizabeth Hospital, including eye doctor Alastair Denniston and his blind brother, Richard Denniston, are ditching their scrubs in favour of cycling vests and helmets to cycle 100 miles in one day at Velo Birmingham, to raise money for the hospitals Charity. Alastair, an Ophthalmology Consultant who has worked at QEHB for five years, is one of five cycling enthusiasts from the Ophthalmology department who will join QEHB Charity’s team at Velo Birmingham. His career choice was inspired from a young age by his brother, Richard, who has been blind since shortly after birth and who will join Alastair and his colleagues on the ride. The 42-year-old, who lives in Harborne, with his wife Sarah and two sons Arran and Ewan, helps to diagnose disease and provide treatment for patients who have problems with their eye sight. Along with his brother, Alastair will be joined by staff from the Ophthalmology department at QEHB, including Tim Matthews, Andrew Jacks, Simon Dulku and Mike Burdon, who will all join 15,000 thousand others, many of whom are raising money for QEHB Charity, at Velo Birmingham; a 100-mile closed-road bicycle race that is coming to the second city on Saturday 24 September. To sponsor the Ophthalmology team, please click here. Although places for Velo Birmingham have sold out, QEHB Charity has a limited number of Golden Bond places available. To get yours for £40, all you need to do is click here to register and pledge to raise £400 in sponsorship or call 0121 371 4852 for more information.